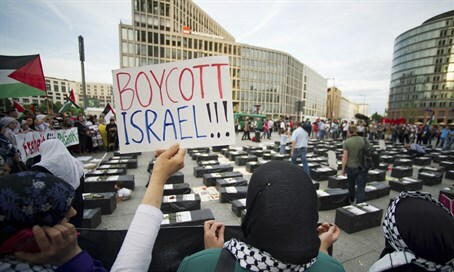 Florida follows the lead of Tennessee, passes resolution condemning the anti-Israel BDS movement. "Florida and Israel have enjoyed a long history of friendship and are great allies of our shared Democratic values," stated PJTN's Board Chairman Stanley G. Tate. He worked closely with Florida State Senator Miguel Diaz de la Portilla and State House Representative Lori Berman in drafting the bi-partisan resolution to condemn BDS and call a halt to the increasing incidents of anti-Semitism on Florida campuses. Following Tennessee's landmark resolution to confront BDS, the states of New York, Indiana and Pennsylvania also passed similar declarations. Some 35 more states are considering doing the same. PJTN explains that as efforts increase to boycott Israeli political leaders and businesses, and as anti-Semitic attacks on university campuses grow worldwide, grassroots activists are mounting pressure on their state legislators to condemn "this anti-Semitic, anti-Israel, and anti-Zionist propaganda campaign." The Tennessee resolution declares the BDS movement to be “one of the main vehicles for spreading anti-Semitism and advocating the elimination of the Jewish state.” It adds that BDS activities in Tennessee “undermine the Jewish people’s right to self-determination, which they are fulfilling in the State of Israel.” It notes, too, that BDS and its agenda are “inherently antithetical and deeply damaging to the causes of peace, justice, equality, democracy, and human rights for all the peoples in the Middle East." During a recent interview for an upcoming documentary exposing the BDS movement, Harvard Law Professor Alan Dershowitz stated: "So what does BDS stand for? Bigoted, Double, Standard. That is what BDS is all about. It is bigoted because it focuses only on the nation state of the Jewish people, and it applies a double standard to the nation state of the Jewish people." Laurie Cardoza-Moore, founder and president of PJTN, had harsh words for President Obama: "Unfortunately, now the President of the United States has joined the growing chorus of global voices calling for boycotting Israel. His past treatment of Israel's PM and his absence during Netanyahu's address before both houses of Congress in March of 2014, and his recent endorsement of labeling products manufactured in Judea and Samaria, further lends legitimacy to the BDS movement and anti-Semitic attacks. Obama's despicable action of boycotting America's only legitimate ally in the Middle East threatens to further isolate and demonize Israel." She called on other state legislatures to learn from Florida's example "as we begin to expose the malicious intent of the BDS campaign… With 70% of Americans supporting Israel over the Arab-Israeli conflict, I am calling on Christians, Jews and people of conscience to add their voices to this groundbreaking initiative by contacting PJTN.org and launching this initiative in their states. It's time to confront these anti-Semites head-on!"